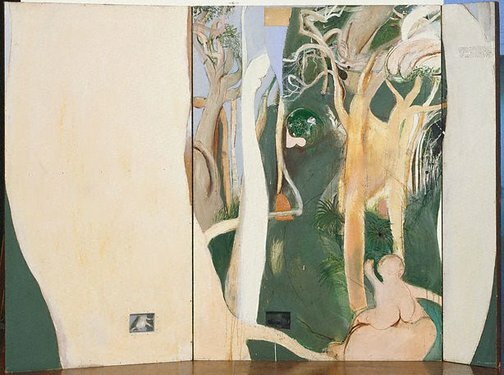 Signed and dated c. verso [panel a], white oil "...1966/ ...Brett Whiteley". Signed and dated upper c. verso [panel b], white oil "...1966/ Brett Whiteley". Signed and dated upper c. verso [panel c], white oil "...1966/ ...Brett Whiteley". Sandra McGrath, Art and Australia , 'Profile: Brett Whiteley', pg. 368-`73., Sydney, Jun 1967, 368 - 373 (illlus.). Bulletin , Sydney, 16 Mar 1968, 72. Bulletin , Sydney, 17 Feb 1968, 64.